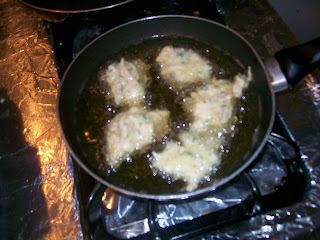 These fritters are made from dry salted cod that has been de-salted and rehydrated. 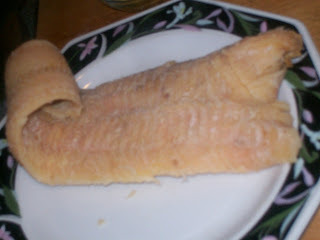 Dry salted cod is called "Bacalao" by Cubans, Spaniards, and I assume Portuguese to. Bacalao has been around for probably ages and was popular because it can last a very long time and didn't need refridgeration or anything in the old days. 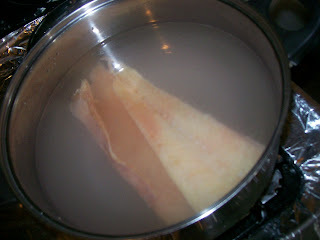 It is still popular in Spain and Cubans also enjoy Bacalao. 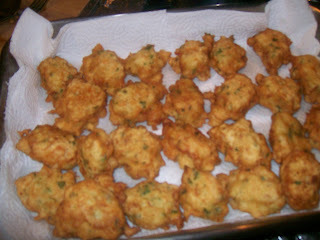 He use to be known for his salted cod fritters, and sold them in his "Bodega" (small food grocery place), my Tata tells me he use to make big batches and keep them warm in some container and start selling them at around 8 AM and everyone loved them at the time they sold for 10 cents each fritter. 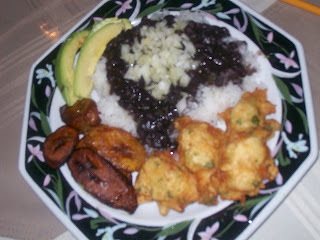 So yeah this recipe is fairly old, the last time everyone heard from Raymundo Gutierrez was in 1963, he had citizen ship in the US and as well and fought in world war 1, he left Cuba during the revolution, but he was hearing rumours of how Fidel Castro was gonna "make Cuba better" and all his false promises, he was decieved and decided to go back to Cuba, he was told he could keep his business and what not, when he left my Tata and grandfather would send him his retirement checks from here but they would get cashed and they never would hear from him, after investigating someone was cashing them but it wasn't his signature, and he never responded to letters, time passed and they didn't here from him or anything. They passed him for dead no one knows what really happened, my Tata thinks maybe he was killed like so many where during the first 5 years of the dictatorship for having a big mouth, or he realized what he got himself into and tried to escape and probably died at sea trying to get back to US. Not sure. 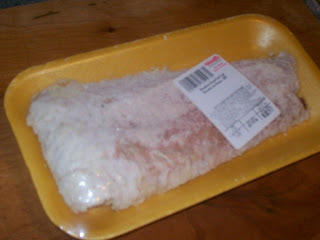 (2)Now get the de-salted bacalao and remove any spines or skins and flake into small bite size pieces, set aside. (3)Now put the flour in a large bowl, and add baking soda, add eggs slowly add water until you get a pancake batter consistency, you may need more water than called for just eye ball it add a little at a time and be sure it's a loose pancake batter consistency. 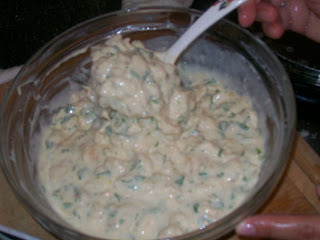 Mix in parsley and mashed garlic. 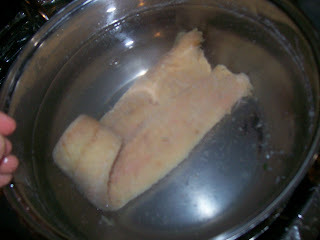 Then fold incorporate flaked cond fish. 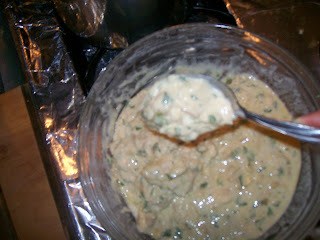 (4)You now have your batter, cover it all let it rest atleast 2-3 hours in the refridgerator preferably let it rest over night. 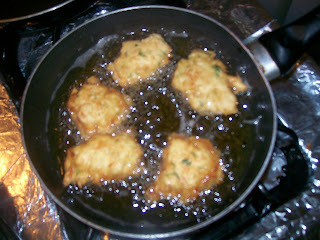 (5)When ready heat enough oil to deep or pan-fry at medium high heat for about 4-5 minutes (to test it I dip a wooden spoon and if it sizzles and or bubbles around it's ready) now get the batter and drop it by the tablespoonfuls and fry until golden on both sides you can move it around with a fork and a spoon. 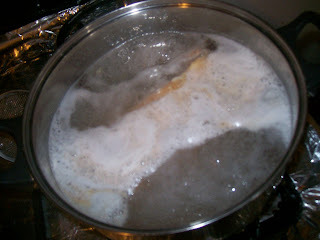 (6)Do not over crowd pan, and have a large plate or whatever with papertowels or paper bags to drain them on. 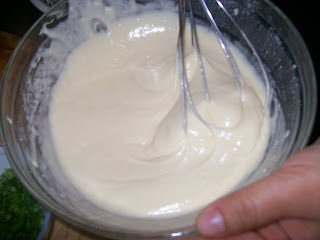 (7) Enjoy while hot the batter can last a while so you can fry only what your gonna eat. In Philippines, it is not recommended for a male to like cooking. Yes if the male love to cook for sure the taste in super. Sad story about Raimundo. On a lighter note, I love eating bacalaitos on the beach in Puerto Rico with an iced cold beer! vey similar to roman baccala'!! Nathan...the street where the 'bodega' was located must have been Belascoain. I've had cod fritters in Cuba, Spain, Portugal, and Italy. All delicious and very similar. Frituritas and cold beer...yum! Poor Raymundo...he was fooled by the Castros like so many other Cubans who had high hopes in 1959. Sorry not interested but wonderful blog, my closest Filipino friend Shantall and her mother are Cebuano and have taught me how to cook some delicious meals. I'll check your blog more thoroughly when I have time I love to learn new things and see the beauty in other cultures. Hehe salty stuff and seafood go great with ice cold beers. Thanks for heads up Mamey, I'll edit and fix all the spelling and grammar stuff later I was typing pretty fast and being careless, but I'll revise soon :) and yes poor Raymundo :( Castro destroyed the lives of so many and his regime continues to deteriorate Cuba. Castro is a monster even his own mother ended up fleeing Cuba and some of his children for fear of being killed by him. Your cooking, like always, is excellent! Ve a recoger un premio a mi blog. Hi, Nathan! 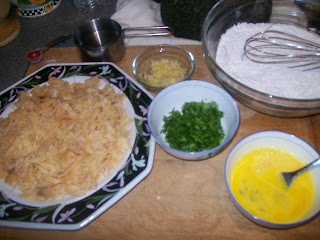 I really enjoyed seeing how to make the salt cod fritters. There was some lying loose in a box at WF and I picked up a piece and thought how fun it would be to chase DS around the house with it (I am such a bad mom). I'm glad to know how to transform it into something edible, LOL! Gosh, what a sad story about your grandfather. Not knowing what happened to him must be hard.